by Jeremy Waldron. Cambridge, Massachusetts: Harvard University Press, 2012. 304pp. Cloth $26.95. ISBN: 978-0-674-06589-5. Just what may be said to constitute hate speech is contestable. If nothing else, the ‘hate’ element in the phrase ensures this, for emotions are always, on some level, experienced subjectively. For the purpose of his engagement with the subject Waldron describes ‘the phenomenon that is sometimes called “hate speech”’ as ‘publications which express profound disrespect, hatred, and vilification for the members of minority groups’ (p.27). In this most contentious and controversial area it nevertheless seems that even those most committed to protecting ‘freedom’ of speech do not deny that such a phenomenon exists. Instead, they rather claim that there is simply no good enough reason for the state to suppress it through law. The debate between those who deny the need for such controls on speech and those who support them or at least argue the case for some level of restraint has been at its most interested and vehement in the United States of America. So it is not surprising that this current intervention is a substantially augmented version of the argument presented in Jeremy Waldron’s Oliver Wendell Holmes Lectures given at Harvard under the title of ‘Dignity and Defamation: The Visibility of Hate’ in 2009 and subsequently published in the Harvard Law Review in 2010. Waldron is careful to point out (several times) that his purpose here is not directly to advocate hate speech laws for the United States but rather to explicate why some societies have chosen to have them. There are several good reasons why this is a book to which students of law and of politics should be exposed. First, because it seeks to raise doubt about the blanket assumption all too often made in the U.S. that First Amendment freedom of speech is such an overarching good for all (would-be) democratic societies that it must inevitably trump all other conceivable goods that might possibly be undermined by its unfettered exercise. And within the space of that doubt there is room to consider also the harms that hate speech brings; indeed, one reviewer has commented that this book might also have been called ‘The Harm in Free Speech’ (Fish 2012). The second reason for recommending this book is because of the care with which it traces some of the harms that free speech may, under particular circumstances, do both to the individuals who are its object and to any society that tolerates, even defends, such harm. And finally, because it is written with clarity and precision and illustrated with examples that bring the realities of hate speech to life, the book offers an exemplary pedagogy of rights and conflicts of rights. In an introductory chapter Professor Waldron describes his ‘modest intention to offer a characterization of hate speech laws as we find them in Europe and in [*199] the other advanced democracies of the world’ (p.11) and to offer a reminder of instances where legislators and judges in America have in fact addressed the problem that such laws are designed to control. In so doing he offers an American audience information about countries that are effective working democracies where the value of open communication of ideas is respected and that nonetheless regard their hate speech regulations not as violations of a right of free speech but rather as a way to facilitate the human rights of all their citizens. Chapter Two engages with the sanctity of speech defended in Anthony Lewis’s Freedom for the Thought We Hate, continuing an exchange begun earlier over Waldron’s review of that book. In counter to the argument encapsulated there, Waldron points out that publications expressing ‘disrespect, hatred, and vilification for members of minority groups’ raise a particular difficulty. He does so through a parallel with the crime of seditious libel that, as the state became so powerful that it did not need legal protection from ‘the puny denunciations of the citizenry’, ceased to exist. Can it be claimed, he asks, that the status of vulnerable minorities in American society is now ‘so well assured that they have no need for the law’s protection against the vicious slur of racist denunciation?’ That would be to say that racist attacks do no harm to the targets of hate speech. And it is also to say that, in Waldron’s pointed and accurate observation, ‘The harm that expressions of racial hatred do is harm in the first instance to the groups who are denounced or bestialized in the racist pamphlets and billboards. 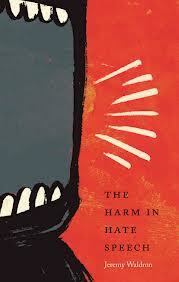 It is not harm – if I can put it bluntly – to the white liberals who find the racist invective distasteful’ (p.33). This point that the ‘we’ of lawyers and a white majority who can and should be resilient to any unpleasantness in the practice is not the ‘we’ who actually experience the harm of the performative qualities of hate speech is elaborated in Chapter Three through a discussion of the reasons why hate speech may also properly be called ‘group libel’. Hate speech, unlike hate crime, is not a matter of motivation but rather of an outcome that is being incited and that is how the issue is phrased in the European, Canadian and New Zealand legislation against it. At the heart here is the distinction between trying to suppress hate as an improper emotion felt by some individuals and punishing the incitement of it in society to the detriment of those who are subjected to hatred directed at their ethnicity, religion, or other group characteristic. By using the terms ‘group libel’ or ‘group defamation’ it is possible to describe more accurately the nature of the harm in question. The issue here remains defamation of individual members, but via group characteristics, not defamation of the group as such. Hence the proper use of hate speech laws is to protect individuals not groups. Chapter Four, entitled ‘The Appearance of Hate’, then turns to the social harm produced through hate speech and the ‘substantive purpose of legislation that seeks to suppress it’ (p.65). This is done through the contrast of a ‘well-ordered’ (Rawlsian) society where ‘what we would hope to see in a society that was open to the lives, opportunities, and expectations of members of every group’ is compared with ‘the ugly visual reality [*200] of a society defaced by racist or homophobic or Islamophobic slogans’ (p.65). This is explicitly not an exercise in technical theorizing but rather a look at the visual pollution likely in a society where group defamation is permitted. He argues that such appearance does far more than look (or sound) ugly; it changes how things actually ‘are’. A well ordered society shows all of its citizens that ‘when they leave home in the morning they can count on not being discriminated against, or humiliated, or terrorized. They can feel secure in the rights that justice defines’ (p.84). In other words, they can be secure in their dignity and reputation rather than enduring a social environment in which the very foundation of that dignity is conceived as somehow in competition with a rival good – in freedom for speech that disrespects. This is neither a responsibility for government alone nor a matter of government interference with private acts. People have a responsibility for the maintenance of an environment safe for all and ‘Hate speech and group defamation are actions performed in public, with a public orientation, aimed at undermining public goods’ (p.100). Chapter Five explores further the distinction that should be drawn between protecting dignity, which Waldron argues is an appropriate use of law, and protecting from offense, which is not. This distinction is framed as the difference between dignity as pertaining to respect for status and offense as more simply wounded feelings not accompanied by loss of dignity. And again this is about the protection of the dignity of individuals based on imputations of group characteristics, not the dignity of the groups as such. A final section in this chapter addresses the question of whether the concept of dignity as used here is to vague to do the work asked of it. While acknowledging that dignity can indeed be just ‘a soft and mushy idea’ designed to garner approval ‘without analytic scrutiny’ for all manner of normative proposals and also that there are a plethora of theories of dignity available to us, his own usage is a quite general one intended ‘to capture something about the high status we accord every person in social and legal interactions’ – the importance of the interest that people have in their social status and reputation as ‘ordinary members of society in good standing’ (p.138). Chapters Six and Seven address the arguments of certain critics of hate speech legislation. First, C. Edwin Baker’s autonomy argument – that restricting my freedom to disclose to the world as a statement of personal identity my racist ideas couched in the most hate-filled language I can devise compromises my individual autonomy. Here the victim is blamed for their inability to rise above abuse and effectively told to ‘get over it’. In response Waldron argues that the harm may be constituted by the speech through which the world is made no longer a safe place rather than simply caused by it and therefore a requirement to demonstrate harm can never be met to a level that will justify restrictions on speech. The second position addressed is Ronald Dworkin’s claim of a loss of legitimacy for other laws that may result from forbidding hate speech. For example, ‘freedom for hate speech or freedom for group defamation is the price we pay for the legitimacy of our enforcing certain laws that the [*201] hatemongers oppose (for example, laws forbidding discrimination)’ (p.174). In this account the price for having legitimate laws against violence or discrimination takes the form of allowing their opponents a voice and this may include permission for hatemongering opposition. Either way the target’s place is in a zero sum game that is loaded against them. The discussion throughout is couched in the language of reasoned suggestion that the reader might want at least to consider alternatives to an unnecessarily absolutist and doctrinaire position on the sanctity of speech. As such it is a persuasive invitation to considered and respectful reflection on just how much ‘free’ speech a multicultural and religiously diverse society can actually stand while still retaining the social fabric of a good society. And that is a topic with which we should all engage. Lewis, Anthony. 2010. Freedom for the Thought We Hate: A Biography of the First Amendment. New York: Basic Books. Copyright 2013 by the Author, Catherine Lane West Newman.